We bet one of your New Year’s resolutions is to travel more and visit new places around the world. If you haven’t picked your destinations yet, we recommend you to check out some of these amazing 15 places. They are not your usual touristic landmarks that everybody knows and talks about so you might have missed them even if you already visited these countries in the past. 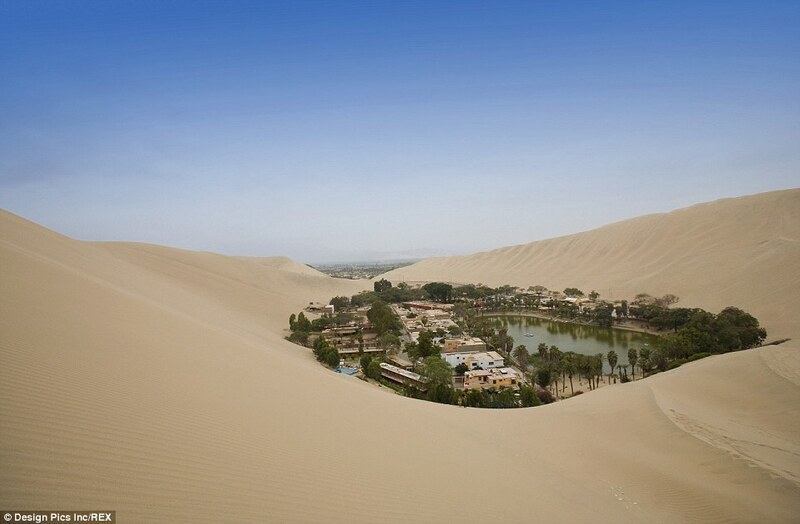 Huacachina is an oasis town situated in the midst of a barren dessert in Peru. Its lagoon and lush palm trees create such a contrasting image compared to its dry sandy surroundings that Huacachina might seem a mirage. But the place is real and is considered to be one of the very last oasis in North and South America. Huacachina is located only 4 km away from the city of Ica, so you shouldn’t worry about getting lost in the dessert without water or other commodities. The 96 residents of Huacachina wil welcome you with everything you need, from hotels to shops and even a library. Besides the surreal views, you can enjoy sandboarding or canoeing in the blue waters of the lagoon. There are many theories on how this magnificent place was created. According to one of the legends, a young princess that was bathing was discovered by a hunter and she fled, leaving behind a pool of water. Also, her flowing cloak is said to have created the sand dunes. Discovered only recently (in 2009) Hang Son Doong is the world’s largest known cave, with a height that reaches even 200 metres in some areas. The cave has its own river rapidly flowing through it and contains some of the tallest stalagmites in the world (up to 70 metres tall). Hang Son Doong (meaning “mountain river cave”) is situated in the Quang Binh province of Vietnam and it was created 2-5 million years ago by river water eroding away the limestone underneath the mountain. Tourists can camp inside the cave and explore the wonders created by nature. Access in the cave is limited though, with only 800 permits available for visitors for the 2017 season (February-August). After August, heavy rain floods the cave making it inaccessible for visitors. You will for sure experience a magical time walking on a fairy tale-like narrow path in the forest surrounded by a lush carpet of bluebell flowers. This whimsical and surreal looking place is located in Belgium and is called Hallerbos or Halle Forest, also known as the Blue Forest. The abundance of bluebells suggests that the forest is ancient as it takes many years for the flowers to grow and flourish as they do now. However, the trees in this forest are not as old as the flowers. Most of the original trees were actually destroyed in World War I and new trees were planted between 1930 and 1950. The best time to visit the Blue Forest is in the European spring and early summer (March-June), when the flowers are in full bloom. Besides the bluebells, there are many other wild flowers to be admired in Hallerbos and a multitude of wildlife as well. With the birds singing, the red squirrels scattering around, the frogs swimming in the ponds and the deer making short appearances, you can easily imagine yourself in an otherworldly enchanted forest. If you’re interested in archeological findings and you’re curios about ancient civilizations, the “Lost City” of Petra in Jordan is the perfect place for you to visit. The entire city is carved in sandstone and it used to be the capital of the Nabataean empire between 400 B.C. and 106 A.D., before the Nabataeans were conquered and absorbed into the Roman Empire. Besides the breathtaking architecture carved in pink rock (another name for this place being the Rose City), you can admire the innovative networks of water capture, storage, transport and irrigation systems built by the Nabataean population over 2000 years ago. According to archeologists, only 15% of the city has been uncovered so far. The rest is still underground and untouched, waiting for the excavations to reveal more wonders. In 1985, the Petra Archaeological Park was declared a UNESCO World Heritage site, and in 2007 it was named one of the new seven wonders of the world. The Hitachi Seaside Park is a public park in Hitachinaka, Ibaraki, Japan. The most amazing thing about it is that it features millions of blooming flowers around the year. For example, in springtime, the park houses 4.5 million of the translucent-petaled blue flowers called baby blue-eyes, a million daffodils, 170 varieties of tulips and many other flowers. In autumn, Hitachi Seaside Park is equally beautiful with colorful bushes of herbs (Bassia scoparia) and pampas grass. For more adventurous visitors, there’s an amusement section within the park called “The Pleasure Garden”, including a giant Flower Ring Ferris wheel, a roller coaster, a labyrinth, the Water Plaza (with water tunnels and fountains), a cycling road, BMX course, athletic field, and a barbeque space. You can remember the wonderful time spent in Hitachi Seaside Park by purchasing a souvenir from one of The Pleasure Garden shops. You can choose from traditional ceramic pieces, original park souvenirs, clothing items with inscriptions and other local product. Last but not least, visitors can try out specialty snacks from Japanese cuisines in the restaurants section of the park. Land of polar bears, snow, glaciers, fjords, aurora borealis, half-year day and half-year night, Svalbard is the perfect destination if you are looking for a magical Arctic experience. The archipelago is situated midway between continental Norway and the North Pole and houses around 2,600 residents. Even though Svalbard has an Arctic climate, the average summer temperatures range from 4 to 6 °C (39 to 43 °F), so you are not going to be freezing cold. The islands of Svalbard were first taken into use as a whaling base in the 17th and 18th centuries, after which they were abandoned. The archipelago became inhabited by permanent communities at the beginning of the 20th century, when coal mining activities started in its mountains. In addition to Svalbard’s dramatics sights, with seemingly endless icefields and overwhelming icebergs, Svalbard offers many possibilities for exploring further, such as boat trips, glacier hikes, snowmobile expeditions or rides led by a team of huskies. The best time to visit Svalbard is May-September if you wish to see polar bears and November-January if you are after the aurora borealis or the Northern Lights. For a relaxed and secluded summer holiday, you might want to check out the hidden gem of Rangiroa, an atoll in the Tuamotu archipelago in French Polynesia, South Pacific Ocean. Visitors who scuba dive can get close to the beautiful sea life by observing dolphins, sharks, manta rays, turtles and many colorful fishes. You can see dolphins jumping out of the water by taking a boat ride as well. Another great trip is the tour to the Blue Lagoon, with its spectacularly clear turquoise water and breathtaking sight. You might even spot an occasional blacktip reef shark now and then. The breeding of pearl oysters in the lagoon produces black pearls. In fact, pearl farming is the main activity for most families in the Tuamotu archipelago. Rangiroa has only two permanently inhabited islands (with around 2,500 inhabitants) and the main villages are Avatoru and Tiputa. The airport is on the same island as the Avatoru village but you have to travel by boat to get to Tiputa. How many times do you have the chance to see a natural sculpture shaped like an animal? The Elephant Rock in Iceland is exactly what its name suggests: a huge rock shaped by mother nature in the form of an elephant’s head. This natural wonder is located on the island of Heimaey (meaning Home Island) in Iceland’s Vestmannaeyjar archipelago. The nearby volcano (called Eldfell or “Mountain of Fire”) is believed to be the cause of the Elephant Rock. The basalt rock gives the surface the appearance of wrinkled elephant skin making it even more similar to the real animal than just the shape of the rock itself. So if you visit Iceland, don’t miss the chance to see this enormous elephant seeming to emerge from the Atlantic Ocean. A place called the “Door to Hell” might not entice you to visit it, but we guarantee that it’s worth it. This crater in Derweze, Turkmenistan is basically an enormous pit hole with a fire constantly burning inside of it. The “Door to Hell” name is most appropriate to best describe it. In 1971, geologists drilled through a cavern filled with natural gas and the ground beneath the drilling rig collapsed, exposing a large hole with a diameter of 70 metres. To avoid poisonous gas discharge, it was decided that the best solution was to burn the gas off. Geologists thought the fire would use all the fuel in a few days, but the gas is still burning today, after more than 40 years! The “Door to Hell” is not your typical travel destination but it sure provides a once in a lifetime experience. Hidden in the undergrounds of Turda, Romania, this amazing salt mine is definitely a place worth visiting if you are after something never seen before. Besides its long and tall halls and incredible salt stalactites, Turda Salt Mine (known as “Salina Turda”) is also a halotherapy center providing treatment for allergic respiratory diseases and other respiratory and internal illnesses. But the salt mine microclimate is beneficial for everyone as it improves respiratory functions. You can play different sports and experience many fun activities while at Salina Turna. For example, you can take a ride in the big wheel with gondolas, you can play minigolf, minibowling, table tennis, billiard etc. There are even football and handball fields available for rent so that teams can practice in this healthy environment. The salt mine includes a special amphitheater that hosts concerts and other events. So there’s something to do for everyone in this incredible underground micro-universe. 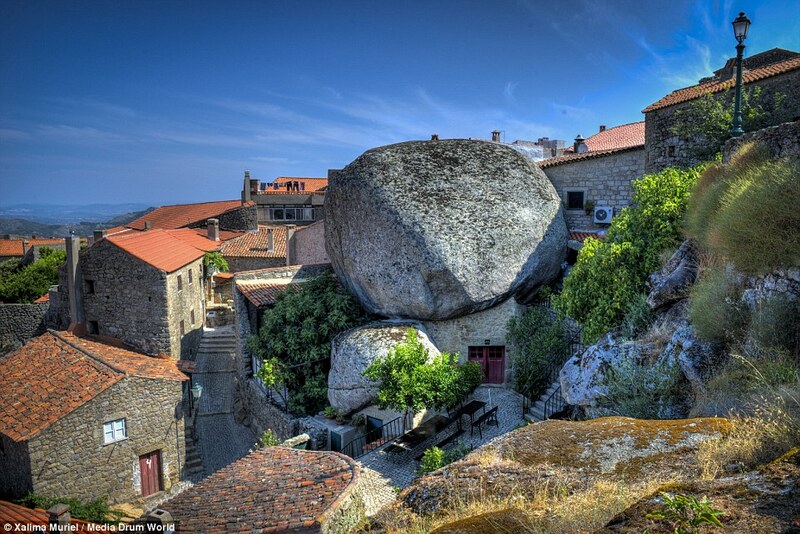 The unique thing about the town of Monsanto in Portugal is that its houses and other buildings are nestled between, around and on top of gigantic rocks. Instead of altering nature to build their homes, the first civilization that settled in this area, the Lusitanians, decided to shape the buildings around the oversized rocks, leaving them intact. It is amazing how people preserved the integrity of the environment for such a long time! Some houses in Monsanto have 200-tonne rocks as rooftops, but the 800 residents don’t worry that the rocks might collapse. After all, they have been steady for thousands of years, dating back to the 6th century B.C. The cliffs surrounding the village keep enormous rocks in balance making it look even more dangerous to live there. As Monsanto is situated on a mountain, it also offers a magnificent view down the slopes. Another interesting place to visit while in Portugal is the Quinta de Regaleira estate, located near the historic center of Sintra and classified as a World Heritage Site by UNESCO. Built at the end of the 19th century-the beginning of the 20th century, the property consists of a romantic palace and chapel surrounded by a luxurious park that features lakes, fountains, benches, wells and other constructions. The main architectural attraction of the Quinta de Regaleira estate is the rich decoration, including frescoes, stained glass windows, wood carvings and many more beautiful detailed work. For example, the façade of the palace is decorated with intricate pinnacles, gargoyles, capitals and an impressive octagonal tower. The wells are in fact inverted towers that you can visit as they are lined with spiral staircases that lead to small landings where initiation rites and ceremonies used to be held. The palace itself is very much worth visiting with the different rooms and chambers offering a glimpse into what it was like to be part of royalty in the early 1900. Many cultural events are being hosted here making great use of this magnificent place. For those in search of thrilling adventures, there’s even an enigmatic system of tunnels connecting different buildings on the property! Perfect for a getaway, the Marieta Islands are a group of uninhabited islands situated near the coast of Nayarit in Mexico. Being so remote and secluded, the place is also called the “hidden beach” or “love beach”. But you won’t be entirely alone on Islas Marietas. There’s an abundant marine life, with 44 different species of plants and wildlife including a variety of corals, reef fish and many species of seabirds. You can go on a whale watching tour or engage in other fun activities such as snorkeling and scuba diving. Or you can lazily lie on the white sand and dip your feet in the crystal clear water. This man made marvel is located in Sichuan province in China and consists of a series of 60,000 religious sculptures and over 100,000 Chinese characters of inscriptions and epigraphs, dating as far as the 7th century A.D. The statues depict Buddhist, Confucian and Taoist beliefs. The entire Dazu County is reputed as “the county of rock carving” as it houses some of the most artistic rock carvings in China and in the entire world. The huge amount of statues is distributed in 76 different places, but transportation from one another is accessible and convenient with many buses available on sight. 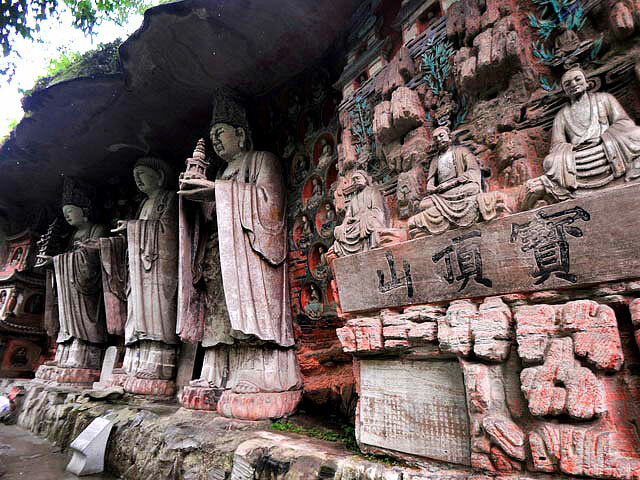 The grotto art in Dazu combines the scientific principles of mechanics, optics with statues themselves and landform. An emerald-green lake surrounded by mountains and forests sounds like the perfect place to visit if you want to reconnect with nature and admire its beauty in a 360° panorama. The best time of the year to go to the Green Lake in Styria, Austria, is during winter, when the area around the lake is used as a county park. In spring, the snow melts and the basin of land below the mountains surrounding the lake fills with water. Unfortunately, water sports and diving activities were prohibited starting January 1st, 2016 as the tourists’ visits damaged the sensitive environment. Before that, divers could enjoy even an underwater bench and bridge, trails and trees at the bottom of the 1-2 m deep lake. You can still spend a lovely time at the Green Lake, just stay outside the water.